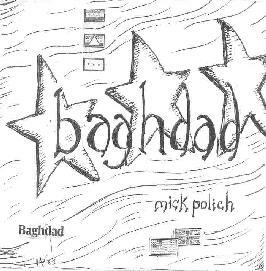 The latest from Mick Polich is a 32 minute work that, as the liner notes state, "started out as a Middle Eastern influenced fusion collection but became a catharsis in noise, chaos, and redemption", and was ultimately influenced by world events. The short opening track, "Tenebrae", is the only song to include guitar, and guest Frank Anelick contributes African drums. It's a quietly intense piece, with the guitar playing in a difficult to describe jazz-fusion/avant-prog style, while the deeeeep bass provides the bottom end and the drums inject a welcome tribal groove. The bulk of the album is made up of the following 20 minute track (that is 2 or 3 titles together). It opens with a standard jazz fusion section in which bass and drums lay down a cool rolling groove while voice samples of people arguing in Spanish and Mexican music are heard in the background. This would be the "We've Got To Get The Mexicans On Board" part. Polich then transitions to a floating space segment that includes a sample of what sounds like helicopter rotors. This must be the title track. The helicopter (or whatever machine) sounds continue and a funky bass jam kicks in, colored by ambient space waves and a variety of more aggressive sounds that create an intense thematic feel. Polich then assaults the listener with a noise and effects dirge and does an excellent job of creating a dark and sometimes disturbing tension. The bass soon rejoins, but bringing back the musical element doesn't let us off the hook by any means. Instead of the harsh effects we're now confronted by the fury of the bass, which unleashes its anger in the form of its own noise and effects jam, essentially creating the same atmosphere that the purer noise did, only in a more "musical" way. And even when Polich brings back the jazz-fusion elements the aggression remains. Very effective, and knowing this was influenced by events in Iraq I couldn't help but see a parade of images from the news in my mind. The short track that wraps up the set is a bass workout that brings 70's fusion á la Jaco and Stanley Clark to mind. Polich jams along nicely, exploring sound and technique along the way. No mind blowing shredding... just nice thoughtful playing. It's a decent track but I was drained after the previous piece which was a passionate and impressive blend of music and sound collage.